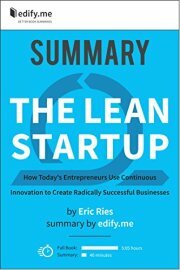 Summary of ‘The Lean Startup’ by Eric Ries. Complete chapter-by-chapter summary. The #1 best-selling summary of The Lean Startup, Eric Ries’ must-read book for entrepreneurs. This is a complete, in-depth, chapter-by-chapter summary of The Lean Startup: How Today’s Entrepreneurs Use Continuous Innovation to Create Radically Successful Businesses. by Eric Ries. The Lean Startup presents a practical and insightful approach to building products and launching startups. 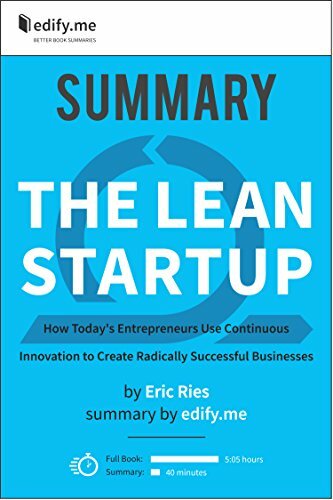 Based on his experience as an entrepreneur and drawing concepts from lean manufacturing and other disciplines, Ries has created a framework for systematic innovation to maximize the chances of startup success. Introduction: 5 principles of the lean startup method. Chapter 1 – Start: Why companies fail; understanding vision, strategy and product. Chapter 2 – Define: The true definition of a “startup”; lessons on innovation from SnapTax and Intuit. Chapter 3 – Learn: Lessons from IMVU’s mistakes; validated learning, scientific testing and reducing waste. Chapter 4 – Experiment: 4 reasons experiments are better than research; value and growth hypotheses; how to run an experiment. Chapter 5 – Leap: Leap of faith assumptions; genchi genbutsu; customer archetypes. Chapter 6 – Test: Minimum viable product (MVP); 4 fears of MVPs. Chapter 7 – Measure: The 3 A’s, 3 steps and 3 tools of innovation accounting; actionable metrics. Chapter 8 – Pivot (or Persevere) When to pivot; 5 points about pivots; 10 types of pivots. Chapter 9 – Batch: Single piece flow; benefits of small batches; continuous deployment; the andon cord; “pull” hypotheses. Chapter 10 – Grow 4 types of sustainable growth; 3 engines of growth; quantifying product / market fit. Chapter 11 -Adapt Adaptive organizations; the 5 whys; proportional investments. Chapter 12 – Innovate Portfolio thinking; startups within an organization; the innovation sandbox. Readability: clear, concise and well-written for easy reading. Retention: structured into logical sections and enhanced with bullet points, lists and quotations to maximize retention of knowledge. Review: provides a fast knowledge refresher when you need it.